It was a warm sunny day in Dallas. Forecasters had predicted cooler weather and so Jackie Kennedy ended up in a Chanel wool suit. She would wear that suit until President John F. Kennedy had come to Texas to do a bit of pre-election fence mending. 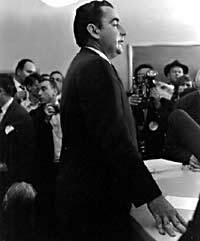 Conservative Governor John Connally and the more liberal Senator Ralph Yarborough were at odds. Surely Kennedy charm could smooth this over. After a stop in Fort Worth, they took a short plane ride to Love Field in Dallas. The motorcade was to follow a winding 11 mile route through downtown Dallas where President Kennedy was to speak at a luncheon with civic and business leaders at the Trade Mart. At 11:50 a.m.. the motorcade left the airport on its rendevous with fate. The reception in Texas seemed promising as did the future.wee hours of the morning of the 23rd. The big presidential limousine, a midnight blue 1961 Lincoln, had been flown in from Washington D.C. 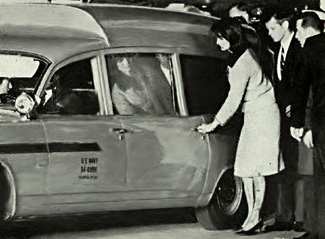 The plastic bubble top was removed and the bullet-proof side windows were rolled down because the weather was so favorable and this is how President Kennedy preferred to ride. Click for info on what happened to the limousine after November 22. The Secret Service’s 1955 Cadillac convertible followed closely behind the president’s limousine. It carried eight agents, with four posted on the running boards to quickly dismount the car to protect the president from the enthusiastic crowds. About the LawIn 1963 it was not a federal law to kill a U.S. president. Thus jurisdiction rested with local and State authorities.The horror story of Dallas convinced Congress that a remedy was required.Public Law 89-141, signed on August 28, 1965, enacted 18 U.S.C. 1751, prohibiting the killing, kidnapping, conspiracy, assault or attempt to kill or kidnap the President or Vice President. Jurisdiction was now federal.Similarly, when Senator Robert F. Kennedy was killed in June 1968, there was no general Federal statute that prohibited the assassination of Members of Congress. Public Law 91-644, signed on January 2, 1971, enacted 18 U.S.C. 351, which extended the protection of the Federal criminal law to Members of Congress, paralleling that extended to the President and the Vice President. President and Mrs. Kennedy were in the back seat while Texas Governor and Mrs. John Connolly were in the jumpseats up front. The motorcade arrived in Dealey Plaza and then turned right from Main to Houston Street and just seconds later it took the 120 degree turn into Elm Street passing the School Book Depository Building. The crowds were larger than expected and very enthusiastic about the young President and his pretty wife. A shot rang out at 12:30 p.m. CST. 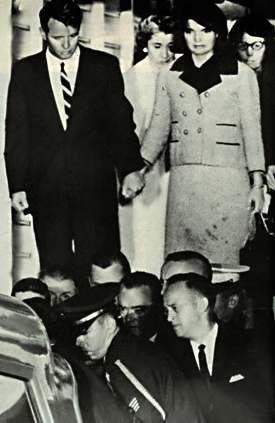 Kennedy’s hands begin to rise and he starts a turn toward his wife. His expression has changed from a smile to astonishment. Connally recognized the sound as a gunshot and begins turning to the right. Riding in the front of the car, Secret Service agent Roy Kellerman said to the driver, Agent William Greer, “let’s get out of here.” But the reaction was slow. Too slow for a bullet that can travel at 1300 miles an hour. The limo was moving at about eleven miles an hour, leaving the President in the sniper’s sights. In the car of Vice-President Lyndon Johnson, Secret Service agent Rufus Youngblood sensed the danger and yelled “get down.” He would hop from the front seat and shove the Vice-President toward Mrs. Johnson, covering LBJ with his body as his duty required. Now President Kennedy is shot, the bullet exiting through the neck while Governor Connally is shot through his back, his raised right hand, with the bullet traveling into his left thigh. He later said that it felt like being punched in the back. Connally leans toward the door but his wife pulls him toward her. Zapruder Frame 246Kennedy gets his hands up to neck level and begins to lean toward his wife. Kennedy’s first wound would probably have been non-lethal. Agent Kellerman yells, “we are hit.” Curiously, Greer hits the brakes. In the follow up car, Agent Hickey searches for a target but finds none while Agent Clint Hill springs from the running board of the car behind and moves toward the President. There has been criticism of the performance of Agents Kellerman and Greer. Clearly, they were slow to react. Spectators are beginning to scatter. At some point, concrete splatter from the pavement sprays onlookers and injures bystander James Tague. Now Greer accelerates, but it is too late. The killing shot has already been fired. With Jackie Kennedy looking on, the shot literally blows off the right side of President Kennedy’s head. Two big chunks of skull were later found; one on the pavement, one in the limo. A huge mist of brain matter and blood spews forth, covering everything nearby, including Mrs. Kennedy. This frame was originally withheld by editors at Life. Zapruder 335 – Connally is slumped into his wife’s lap. Kennedy, now mortally wounded leans toward Jackie. Yes, that blob on the side of his head is his skull and scalp peeling outward and down. An amateur photographer, he is the only one to capture the entire assassination. He used a Bell and Howell Model 414PD with a Zoomatic Director. Life Magazine purchased the rights, but editors decided that some of the photos were too gruesome to publish. In 1975 Time Inc (parent of Life) returns copyright to the Zapruder family, which asks the National Archives (NARA) to store it. Under the JFK Act of 1992, NARA decides to confiscate the film. Eventually they are forced to pay the Zapruder family 16 million dollars. In 1998 Kodak scientists restore the film and it is released to the public. Zapruder 375 – Agent Hill struggles to get onboard to help Jackie Kennedy. The limo now sped up to 80 miles an hour in a race to Parkland Hospital, which is 4 miles away. At Parkland, chaos ensued. Agents surround Lyndon Johnson and over his protests, hustle him inside to protect him. He is now the President of the United States. 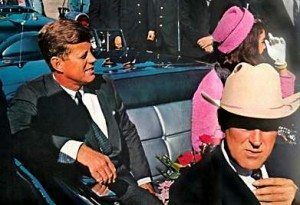 Nellie Connally is annoyed that everyone is fussing over what she knows is a dead man, while her injured husband in the front seat is being ignored. Finally Connally is taken inside the hospital as is Kennedy, still with Agent Hill’s coat over his head, his wife touching him. Upon arrival, about 12:37 p.m., Kennedy still had a faint heartbeat which quickly extinguished. A doctor enlarged the bullet wound to perform a tracheotomy. Had it been any other patient, they most likely would have pronounced him dead but they tried to revive the mortally wounded young President. Cabinet upon their return to Washington later that evening. From left, White House Press Secretary Pierre Salinger, Secretaries Freeman, Dillon, Rusk, Udall and Hodges. Most of the Cabinet was in route to Tokyo. Aboard that plane was Secretaries of State Dean Rusk, Interior Morris Udall, Commerce Luther Hodges, Labor Wirtz, Agriculture Orville Freeman. Press Secretary Pierre Salinger was along as well. Upon receiving the news from Dallas, the plane turned around. Attorney General Robert Kennedy, the President’s brother, received the news at home in McLean, Virginia from FBI Director J. Edgar Hoover. Senator Edward Kennedy was at the Senate. At 12:49 p.m. two priests, Father Oscar Huber and Father James Thompson arrived and Huber gave JOhn F. Kennedy the sacraments with his wife and doctors praying beside him. Mrs. Kennedy returned to the hallway and a nurse asked her if she wanted to wash up. She responded, “no, I want them to see what they have done.” She would repeat this to several people during this day. Governor Connally was stabilized and sent to surgery. He was doing well and would survive. Up until this point, there had been a hesitancy to release much information to the public. Perhaps it was as simple as no one wanted to say the words. All the public knew was that President Kennedy had been shot. No details. But an announcement had to be made. Mrs. Kennedy wanted the time of death placed after he received the sacraments and the Dr. Malcolm Perry agreed to this. It was now 1 p.m. and so it was fixed as the time. Assistant Presidential Press Secretary Malcom Kilduff knew that now all power had shifted to Lyndon Baines Johnson and so he needed his approval to release the terrible news to the public. Approaching him, he prefaced his comments with, “Mr. President.” It hit both Johnson and his wife hard as it was the first moment they knew that the worst had happened. Debate ensued as to the exit plan. 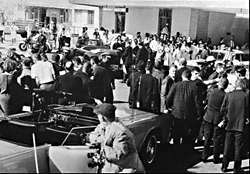 Security was an issue as the nature of the assassination was unclear. Also, Johnson did not want to leave without Jackie Kennedy who would not leave without her husband. 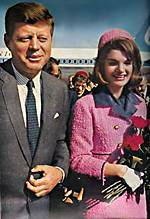 In spite of Secret Service pressure to get to the safety of Air Force One, Johnson said, “I will not leave without President and Mrs. Kennedy.” As a compromise, it was decided Johnson could wait for the Kennedys on board Air Force One and so he was evacuated from Parkland Hospital. Assistant Press Secretary Malcom Kilduff announces President Kennedy’s death. Now the casket arrives from Oneal Funeral Home at Parkland. Big bronze box with white satin interior. The nurses have a problem as Kennedy’s head is still oozing brain matter. Even though they have wrapped his naked body in sheets, the staining is evident and they fear it will ruin the satin lining. They wrap him in a plastic mattress cover. Previously, Jackie Kennedy removed the wedding band from her left hand and slipped it on the President’s finger, and then the casket was closed. It would be returned to her later that evening by one of John Kennedy’s physicians, Rear Admiral Dr. George Burkley, who removed it from the President’s finger after the autopsy. At this time it was not a federal offense to kill a president, although this has since been changed. Consequently, jurisdiction was in Dallas. Dr. Earl Rose announced emphatically that the body could not be moved until after an autopsy was performed and he brought in a judge to reinforce his position. The Secret Service and Kennedy people were equally adamant that they were taking Kennedy with them. The standoff was broken and the Kennedy people won. The hearse carrying the body of John F. Kennedy, accompanied by his widow, sped off for Love Field in Dallas. Coffin bearing the body of John F. Kennedy is carried aboard Air Force One at Dallas Love Field. 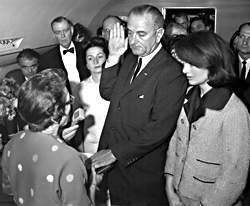 Lyndon Johnson is sworn in as the 36th President by Judge Sarah Hughes. 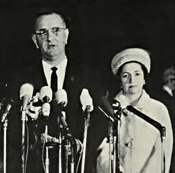 Johnson is flanked by his wife and Jackie Kennedy. Judge Sarah Hughes was summoned to Air Force One to administer the oath of office. Mrs. Kennedy, shaken and quiet, was asked to stand by Johnson as he was sworn in as the 36th President of the United States. 98 minutes had elapsed since Kennedy was pronounced dead. It was 2:38 p.m. CST. By 3 p.m., John F. Kennedy, President for 34 months and two days, had left Dallas forever. At the White House, nanny Maude Shaw took young Caroline and John Jr. to the house of their maternal grandmother, Mrs. Hugh Auchincloss. On board Air Force One, the passengers quickly segregated into two camps, Johnson people forward and the Kennedy clan back with the slain President. It was Jackie Kennedy who first made the comparison to Abraham Lincoln and thus the theme for Kennedy’s funeral was born. The Kennedy people had always found Johnson cloddish, a hick. They had one last hurrah in the spotlight, a few more moments of power in these last days until Kennedy was laid to rest. They were not about to let the crude Johnson interfere. Lyndon Johnson was stuck between the proverbial rock and a hard place. National unity meant a commingling of the old and new administrations. Yet attempts to reach out could be seen as a power grab. By 6:05 p.m. EST when Air Force One landed at Andrews Air Force Base, Washington had darkened. Johnson had wanted to accompany Mrs. Kennedy but the Kennedy clan would have none of that. They literally blocked his path to the rear. Attorney General Robert Kennedy rushed aboard the plane, swept past Lyndon Johnson and rushed to Jackie Kennedy. the Original CasketThe casket from Oneals, the one that transported President Kennedy to Washington was slightly damaged in transfer. Once at Bethesda, a new casket was acquired from Gawler’s Funeral Home and this is the one in which Kennedy was buried.So what happened to the Oneal casket? After haggling to reduce a big charge, the bill was paid for the casket. Gawler’s Funeral Home came into possession of the box when they substituted their own coffin and they turned the Oneal box over to the National Archives.Now Mr. Oneal, even though he has been paid, wants the box back. Can’t blame a guy for trying. Meanwhile, the coffin is stored in a secure vault in the basement of the National Archives. Understandably, Robert Kennedy wants to dispose of it. After some negotiation, the Department of Defense dropped the coffin into the sea in February of 1966. President Kennedy’s casket was loaded unto a forklift. Following that was Robert and Jacqueline Kennedy. It was an image that shocked a nation. This meticulous woman was all bloody and disheveled. The world could now see the horror of the day. Kennedy’s body, accompanied by his wife and brother was loaded into an ambulance for the trip to Bethesda Naval Hospital while the world watched. Although they could have taken up residence at the White House, the Johnsons choose to stay in their home, The Elms, a Norman mansion in Washington’s Spring Valley section. When Johnson went directly to the White House that night, he choose his old office in the Executive Office Building over the Oval Office. At Mrs. Kennedy’s request, the children returned to the White House. That night, as Maude Shaw tucked Caroline into bed, she told her the sad news of her father’s death. The autospy at Bethesda will forever be a source of controversy. The principal work was done by pathologists Commander James Humes, Commander J. Thorton Boswell, and Lt. Colonel Pierre Finck. They photographed, x-rayed and autopsied John Kennedy. Ken O’Donnell, Lawrence O’Brien and Dave Powers went to Gawler & Sons Funeral Home to select a casket. They choose a dark mahogany with silver handles. The Kennedy clan wanted the Navy to embalm the President but the Navy declined as this was not a Bethesda function. Thus, Gawler’s would provide this service. Jackie Kennedy remained at Bethesda, still composed, still in the pink suit, still awake. She was not leaving without her husband. Midnight rolled around and November 22, 1963 ended.